Book illustration has never been a forte of Scottish artists. There are William Strang, the Bone family, the Orr brothers, Sir James Guthrie, and the Camerons, brother and sister. After that there are few names left, but there is one, the most prolific, the most versatile, and the most heavily collected Scottish book illustrator and cover designer – Jessie Marion King. Born in 1875, she was a daughter of the manse, her father being the minister of New Kilpatrick, Bearsden. He did not approve of Art as a career for his daughter, and we are told that on her way home from school she used to hide her drawings in the hedges. However, she must have won him over, because she eventually entered Glasgow School of Art. Among her contemporaries were the ‘Glasgow School’. It included Charles Rennie Mackintosh, J. Herbert MacNair, Margaret and Frances Macdonald, and E.A. Taylor. Presiding over this Galaxy of talents was the headmaster, the formidable Fra Newberry who gave Jessie her artistic head. So much so that when the memorial stone of Mackintosh’s new school was laid, in the cavity was a short history illuminated by Jessie. Doubtless it was done in the individual style she had developed, working in Indian ink on parchment with thin pen lines and dots, delicately coloured, often with elaborate borders of stylised birds or flowers. In some ways it was reminiscent of Aubrey Beardsley, an artist she much admired. Along with her fellow students she entered the National Art Competitions at South Kensington in 1897, 1898 and 1899. She won no prizes but gained notices in The Studio. This may have resulted in the commissions from Globus Verlag in Berlin for what were her first published cover designs. The next landmark was the Turin exhibition of Decorative Art in 1902 where she won a gold medal for a cover design, and also gathered favourable attention in the influential Deutsche Kunst und Dekoration. That year she joined the staff of the Glasgow School as an instructor in book illustration. Her book illustrating career was firmly launched with two important commissions. The first, in 1903, was for The High History of the Holy Graal for J.M.Dent, and the second came in 1904 when the Bodley Head got her to illustrate William Morris’s The Defence of Guenevere and other poems. Both works were medieval in nature and her Victorian Gothic style was to be her hallmark for some time, especially in the cover designs she executed for the Gowans and Gray booklets. 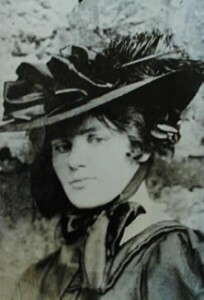 In 1908 she married E.A.Taylor, painter and furniture designer. His work took him to Manchester and they settled in Salford, where, a year later, their only daughter Merle was born. Then in 1911 they moved to Paris where they established the Shieling Atelier. Paris became a second home, and apart from the break caused by World War I, they lived there until 1928 when Merle went to Glasgow University. It was in Paris that Jessie met her next great influence, Bakst, designer for Dhiagilev’s Ballets Russes. She adopted his vivid colours and married to it her existing thin-line technique to evolve a second individual style which she was to continue until her death. Some of her finest books belong to this Paris period. In 1911 The Book of Bridges came from Gowans and Gray with its delicate wash drawings of the bridges of the Seine. 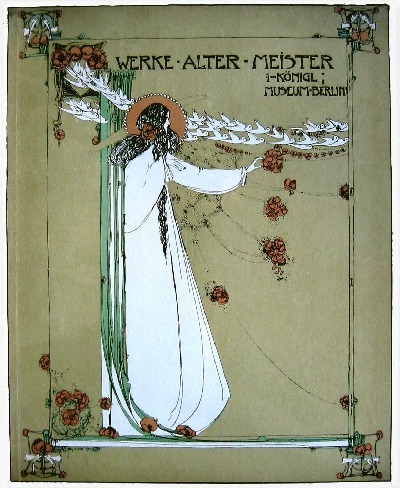 In 1915 Bakst was an obvious influence on her illustrations to Oscar Wilde’s A House of Pomegranates for Methuen. Finally, in 1921, her last major commission, the pochoir-coloured illustrations for Rudyard Kipling’s L’Habitation Forcee published by Rene Kieffer in Paris. After Paris, the family moved to Greengate, Kirkcudbright, where an artists colony centered on E.A. Hornel. The summers were spent at High Corrie in Arran where they ran a painting school. From this period comes the last important book of pen drawings, Kirkcudbright: A Royal Burgh, published by Gowans and Gray in 1934. The drawings were much looser and freer than those in the previous topographical work published by Gowans and Gray in 1909, “Dwellings of an Old World Town”, based on Culross, or the two T.N. Foulis publications on Edinburgh and Glasgow, The Grey City of the North and The City of the West which came out in 1910 and 1911. Latterly it must be admitted that much of her work was of the pot-boiling variety, and her last fully illustrated book, Isobel K. Steele’s The Enchanted Capital of Scotland, published by Plaid Stationary in 1945, is a very disappointing piece of work, but by that time she was seventy, and perhaps we should make allowances. 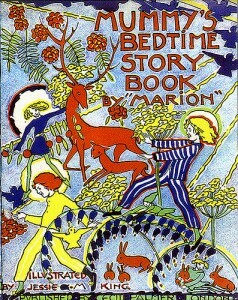 This checklist of books and pamphlets illustrated by Jessie M. King was compiled with reference to the catalogues of the National Library of Scotland, and also to the checklists compiled by Robin de Beaumont published in Private Library, second series vol.10 no. 3, Autumn 1977, whose lists include a few minor items, to be found in publishers’ catalogues, but possibly never printed. Bookplates or greeting cards designed by her, or ephemeral curiosities such as the leaflet she decorated for the San Francisco Disaster Relief Fund, may still await discovery. (1899) Album von Berlin. Berlin, Globus. CO. (189?) The Adventures of Don Quixote de la Mancha adapted for the young. Routledge. CO. (189?) Hanna. Anna Schober. Berlin, Globus. CO.
1899 Ballads. Dante Gabriel Rosetti. Siddal Edition. Ellis and Elvey. CO.
(1899) View Album Edinburgh and District. Edinburgh. Patrick Thomson Cash Drapery Stores. CO.
(1900) Gulliver’s Travels. Swift. Routledge. CO.
(1900) Natural History. J.Wood. Routledge. CO (spine also designed by author). (1900) Album von Dresden und Sachsiche Schwize. Berlin, Globus Verlag. CO.
(1902) L’Evangile de L’Enfance. Translated by C. Mondes. Paris. CO.
(1902) Neuer Deutscher Novellenschatz Band XIV. Berlin, Globus Verlag. (1903) Jeptha. A Drama, translated from the latin of George Buchanan. 1903 Morte d’Arthur. Tennyson’s Idyll. Broadway Booklets. Routledge. 1903 Elaine. Tennyson. Broadway Booklets. Routledge. 1903 Rubaiyat of Omar Khayyam. Broadway Booklets. Routledge. 1903 Guinevere. Tennyson. Broadway Booklets. Routledge. 1903 The High History of the Holy Graal. Sebastian Evans. Dent (also De-Luxe large paper edition limited to 225 copies). 1903 Littledom Castle. M.H. Spielmann. Routledge. Frontis only. 1903 Glasgow Society of Artists. 2nd. Exhibition, March, 1903. Catalogue CO.
1904 The Defence of Guinevere. William Morris (Flowers of Parnassus series no. 22) John Lane. 1904 Album von Berlin. Small version. Berlin, Globus Verlag. CO.
1904 The Life of St. Mary Magdalene. John Lane. CO.
(1904) Tales from Shakespeare. Lamb. CO.
1904 The Boys Own Book of Natural History. J. Wood. CO.
1905 The Arabian Nights, arranged for the perusal of youthful readers by Mrs Sugden. Routledge. CO.
(1905) The Heroes. Charles Kingsley. Routledge Playmate Series. 1905 Catalogue of Bruton Galleries. Exhibition of black and white drawings by J.M.K. (1906) Budding Life by J.M.K. Gowans and Gray. 1906 Our Trees and How To Know Them. Gowans and Gray. CO.
1906 Comus. A Masque. John Milton. Photogravure and Colour Series. Routledge. 1906 San Francisco Disaster Relief Fund Leaflet. 1906 The Marriage Ring. Jeremy Taylor. Gowans and Gray. CO.
1906 Everyman. Gowans and Gray. CO.
(1906) Poems of Spenser (Golden Poets Series) T.C. and E.C. Jack, Edinburgh. 1907 Goblin Market. Christina Rosetti. Gowans and Gray. CO.
1907 Verkaufs Ausstellun Deutscher Kunstler. Contains illustrations by J.M.K. 1907 The Masque of the Two Strangers. Alix Egerton. Gowans and Gray. CO.
(1907)? Rabbi Ben Ezra. Robert Browning. Foulis. 1907 Isabella or the Pot of Basil. John Keats. Foulis. Editions bound in paper, cloth, and suede, all with similar design. 1907 Allandine and Palomides. Maurice Maeterlinck. Gowans and Gray. CO.
(1907)? Aucassin and Nicolette. Gowans and Gray. CO.
(1907) Poems of Shelley. (Golden Poets Series) T.C. and E.C. Jack, Edinburgh. (190?) The Arcadian Dining Rooms Exhibition of Contemporary Artists. leaflet. 1908 Interior. Maurice Maeterlinck. Gowans and Gray. CO.
1908 The Legends of Flowers. Paolo Mantegazza. Foulis. Marginal decorations and cover design. 1908 Tableaux de la Nature. 12 monthly parts. Paris. CO.
(1908) The Death of Tintagiles. Maurice Maeterlinck. Gowans and Gray. CO.
1909 The Wild Flowers. J.H. Crawford. Foulis. CO.
1909 Dwellings of an Old World Town. Culross, by J.M.K. Gowans and Gray. 1909 The Secret Princesses. Maurice Maeterlinck. Gowans and Gray. CO.
1909 Our Flowering Shrubs and How to Know Them. Gowans and Gray. CO.
1909 The Legends of Flowers. Second Series. Paolo Mantegazza. Foulis. 1910 The Grey City of the North by J.M.K. City Series. Foulis (variant 1914). 1910 The Legends of Flowers. Third Series. Paolo Mantegazza. Foulis. (1910) Youth and Love. Collins. 32pp. Endpapers only designed by J.M.K. 1911 The City of the West by J.M.K. Glasgow. City Series. Foulis. (later undated variant). 1911 The Book of Bridges. Edme Arcambeau. Gowans and Gray. 1911 Kilmeny. James Hogg. Foulis. (1911) Songs and Poems of the Ettrick Shepherd. Foulis. (Also dated version, with CO). (191?) A Whip at the Mast, edited by J. Macauley. Greenock. CO.
(1912) Memories. Robert Louis Stevenson. Foulis. CO (variant 1919). 1912 Ponts de Paris. E. Arcambeau. A. Perche. Paris. 1913 Seven Happy Days. Studio Christmas Supplement. 11 pages of illustrations. 1913 The Intruder. Maurice Maeterlinck. Gowans and Gray. CO.
1913 Three Tales. Maupassant. Gowans and Gray. CO.
(1913) The Dream of Gerontius. Roses of Sharon Booklets. Foulis. CO.
(1913) Hand and Soul. D.G. Rosetti. Foulis. CO.
(1913) The Blessed Damozel. D.G. Rosetti. Foulis. CO.
(1913) Friendship. R.W. Emerson. Foulis. CO.
1913 The Poems of Lindsay Gordon. Foulis. CO.
(1913) Aucassin and Nicolette. Foulis. CO.
(1913) Rabbi Ben Ezra. R. Browning. Foulis Friendship Booklets. CO.
(1913) The Lover of Gardens. Foulis. CO.
(1913) St. Paul. Myers. CO.
(1913) The Spell of the Open Air. Foulis. CO.
1914 The Book of Old Sundials. Foulis. 1914 A Little Book of Sundial Mottoes. Foulis. CO.
1914 Cranford. Mrs Gaskell. Methuen. Endpapers designed by J.M.K. 1914 Essays of Elia. C. Lamb. Endpapers only. 1914 Corners of Grey Old Gardens. Foulis. 1915 A House of Pomegranates. Oscar Wilde. Methuen. (1916)? Some Poems by Tom Pringle. Foulis. CO.
1916 War Waves. M. Guthrie. John Smith and Sons. Dust jacket and Frontis. (1917) The Little White Town of Never-Weary, by J.M.K. Harrap. 1919 A Carol. Good King Wenceslas. Studio Christmas Supplement. (1920)? Songs from Longfellow. CO. (192?) Wishart and Brown’s catalogue of Paintings and Drawings By J.M.K. 1921 L’Habitation Forcee. Rudyard Kipling. Editions Rene Kieffer, Paris. 1922 The Interlude of Youth. Gowans and Gray. CO.
1922 Why the Fuschia Hangs its Head. Maud Cockrell. Gowans and Gray. CO.
1923 The Apple Tree. Harold Brighouse. Gowans and Gray. CO.
1924 How Cinderella was able to go to the Ball. A brochure on Batik by J.M.K. Foulis. 1924 Hullo Boys! Cecil Palmer. (2 colour illusts.). 1924 Hullo Girls! Cecil Palmer. (2 colour illusts.). (1925)? Goodfellow and Steven (firm). Broughty Ferry Telephone Service. CO.
1925 The Innkeeper’s Shirt. Maud Cockrell. Gowans and Gray. CO.
(1925) The Paul Jones Tea-Room, Cuthbert Street, Kirkcudbright. 1925 Hullo Boys! Cecil Palmer. (1 black and white illust.). 1925 Hullo Girls! Cecil Palmer. (1 black and white illust.). (192?) Reverie in B for Pianoforte by Percy Harmon. CO.
1926 The Were-Wolf. Alix Egerton. CO.
(1927) Covers for Collins Bumper Reward 2/- Series 1-12. 1927 Covers for Collins Dorian Booklets 1-6. 1927 The Fairy Fruit. Ida Gandy. Gowans and Gray. CO.
1927 A Historical Pageant of Stewartry presented by the Girl Guides. Single sheet, folded. CO.
1928 Covers for Collins Golden Dawn Booklets 1-12. (also endpapers). 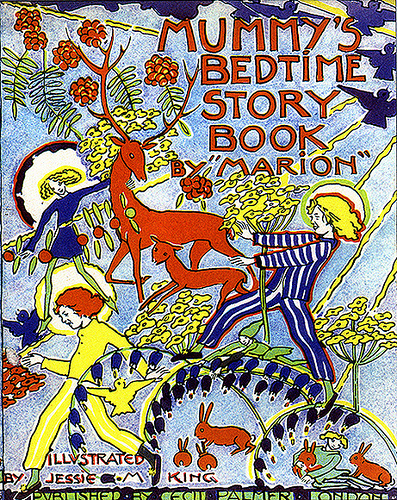 1929 Mummy’s Bed-Time Story Book. (1930)? Miss Cranston’s Lunch and Tea Rooms. Menu. 4pp. CO.
1931 A Bundle of Yarns. A. Wilson. Gowans and Gray. CO.
(1931)? All the Year Round. Collins Clear Type. 1930 Gowans and Gray Repertory Plays, nos. 76, 95, 104, 119, 122. CO.
1932 Book of Scottish Verse by George Burnett. Frontis. (193?) Whose Land? Jessie Pope. Published by the Underground Electric Railways and General Omnibus Company Ltd. London. 16pp. 1934 Our Lady’s Garland. A Corder. De La More Press. 1934 Kirkcudbright: A Royal burgh, by J.M.K. Gowans and Gray. 1935 The Saut-Box. Galloway Pageant at Newton Stewart, 6th July. CO.
1935 The Fringes of Paradise. F. Desmond. Frederick Muller. 1935 The Two Bad Fairies. Kathleen Green. CO.
1945 The Enchanted Capital of Scotland. Isobel Steele. Plaid Publications, Edinburgh. 1946 Ayrshire Schools Concert Programme, 26th January. 1949 The Parish of New Kilpatrick. Privately printed by Maclehouse and Glasgow University Press. This does not claim to be a complete checklist of books and ephemera illustrated by Jessie M. King.